HissTank › G.I. Joe 25th Anniversary › Crowdfunded USS Flagg? Would You Support A HasLab Flagg Project? Crowdfunded USS Flagg? Would You Support A HasLab Flagg Project? With the huge success of Haslab’s first outing, the Vintage Collection Jabba’s Sail Barge (The Khetanna,) meeting roughly 175% of their goal to the tune of nearly four and a half million dollars, it’s safe to say Hasbro will go back to that well in the future. With this in mind, what would you honestly be willing to pay for a new Flagg? Discuss further after the jump! With the huge success of Haslab's first outing, meeting roughly 175% of their goal to the tune of nearly four and a half million dollars, it's safe to say Hasbro will go back to that well in the future. With this in mind, what would you honestly be willing to pay for a new Flagg? For the sake of simplification, let's say we're talking about a near-reissue of the original Flagg, only slightly modified and updated to current standards. Hasbro will address the known weak points of the original design, but for the most part it will be in the same vein as the ME Skystriker, or other vehicles that adhere closely to the original toy. The Sail Barge presale gives us some interesting information. First, their magic number was 5k units. Since Hasbro is still a business, they aren't doing this out of the goodness of their hearts. Presumably, 5k at $500 gives them enough of a profit to make it worthwhile, while also recognizing the margin is probably fairly slim compared to most normal mass-market retail. On the flip side, the Khetanna is an all-new item, designed from the ground up. It will come mostly assembled (the box is five feet long! ), and has a high level of detail. A reissue, updated Flagg could be shipped similar to the original and assembled by the buyer, and as an existing design, already has a lot going for it. All that is to say it sounds feasible. 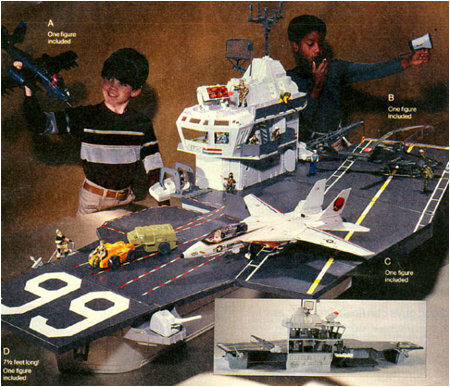 USS Flagg new: $109.99 in 1985 (Sears Wishbook), or $249.43 adjusted for inflation. 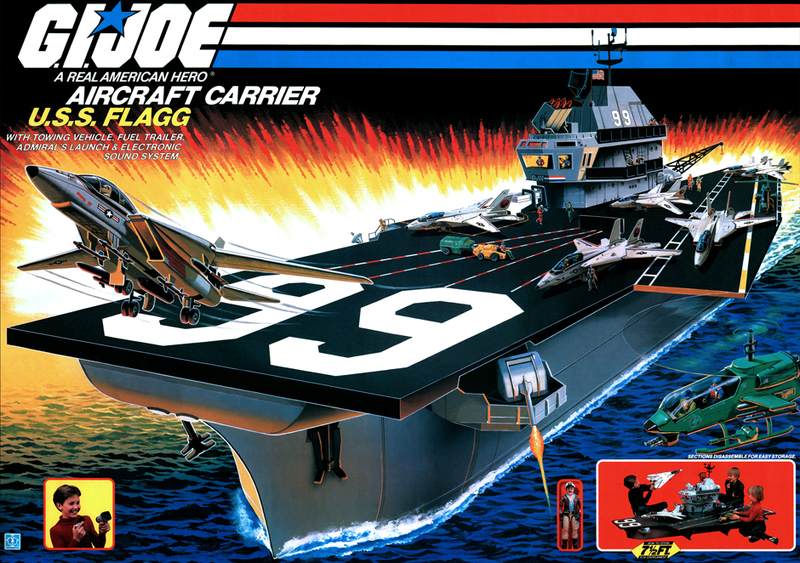 USS Flagg complete on Ebay today avg: $1100 loose, up to a recent sale of an opened-boxed, but never-assembled Flagg for $2400. Personally, I think they could do this at around $750 bucks, and would be a great, yet realistic number for the modern age. What do you think? Vote for what you're willing to pay - not what you WISH you could pay. Any more than $500 and I would probably lose it in the divorce anyway. I personally want a coyote that's large enough to be a troop carrier. Oh yeah, that might have been an interesting metric. I guess we can't add options once posted though. If nothing else you could start a different thread/poll for options besides the Flagg. That being said, is there a market for 5000 Flaggs out there? Did Hasbro even sell 5000 of them originally? I didn't personally know a single kid that got one back in the day, and I even had a couple friends whose families were well off AND had lots of Joes. I would disagree on the margins statement. I don�t believe margins on this would be slim. I�m thinking like 50%. Why else would they do it except to make money. Like you said they are a business and not doing this out of the goodness of their hearts. I seem to recall in the �Toys that Made Us� GI Joe Episode that Kirk Bozigian said they sold 400k units of the Mobat. That was the biggest toy in year one. Probably like a $17 price point. Just an antecdotal bit of info in regards to sales numbers. I can't see them ever doing something as ambitious as the Flagg. You have to remember - the Sail Barge had a couple big advantages going for it: 1) It had never been produced - and collectors demanded it. 2) Star Wars has the most rabid fans out there. Now, a COBRA TRANSPORT COPTER? Price it around $150. I'd buy that. I seem to recall in the “Toys that Made Us” GI Joe Episode that Kirk Bozigian said they sold 400k units of the Mobat. That was the biggest toy in year one. Probably like a $17 price point. Just an antecdotal bit of info in regards to sales numbers. Yeah. I always figured the normal items are in the tens of thousands at least. I'm sure the original Flagg though would have been done at a much smaller volume compared to a MOBAT (which also sold for multiple years). I would disagree on the margins statement. I don’t believe margins on this would be slim. I’m thinking like 50%. Why else would they do it except to make money. Like you said they are a business and not doing this out of the goodness of their hearts. Maybe "slim" isn't the right word, but I'd be pretty surprised to see them making that much above cost. Unfortunately, it's always one of those things we can only broadly guess at. For example, looking at the price of something at regular retail and then when it drops to ROSS, we typically see a 50% difference there. One can safely assume the mainline retailer didn't take a loss to shuffle it down stream, and ROSS is also making money on their end. That would suggest Hasbro's profit is under the 25% mark on most items that go to normal retail. This is the toy version of a manufacturer's Halo car. Chrysler didn't make much money on a Viper (and it even sold at a loss towards the end). But it drove sales towards other stuff. People walked into the dealer to gawk at a Viper, and drove away in a V6 Charger, or Town and Country. This is a similar situation where it's more about exposure within the community, and maybe even a direct answer to the detractors who say (and I admit to being guilty) that Hasbro has dropped the ball for Star Wars collectors. This metaphor breaks down in that there isn't much on the market currently or announced to fill the Sail Barge with. But Feb of 2019 is a ways off. If Hasbro threw together a box set of Jabba's Barge passengers from existing tooling for a hundred bucks? I think a lot of folks would bite. I've noticed the Ebay prices on those figures has already started to rise. Anyway, with all that in mind, I'd put this margin at less than 25%, and probably closer to 10%. Ultimately, even 1% of 4.5 million is a net positive and could go towards development costs of something else down the road (or offset the eventual buy-back of thousands of Constable Zuvios ). This does point out the biggest hurdle for a Flagg to surmount: there's no Joe line otherwise. But, if they can manage to put out a good movie in a couple of years and reintroduce a successful mass-market Joe line, then I'd say the Flagg would stand a chance.